Although quite foxy, Landyer, charisma is reduced somewhat due to her attitude. She can get around that with a charm spell though. Although born to a family of middle class traders she feels that somehow she is the equivalent of a noble. This young lady can be fun, kind, uppity or downright bitchy. Luckily her main attribute is ambition, and anyone who can suffer through her complaining will find her to be a resourceful and talented adventurer. HP: 18 AC: 3This tall, athletic young man is likable, charming and cocky. He’s naturally sarcastic and mocking but usually has a joke, a smile on his face and a tail to tell. He isn’t above chasing young ladies, drinking and finding trouble, but can be quite serious when the situation requires it. In combat a ruthless dark side emerges, perhaps the results of being pressed in to military service at a much to young age. 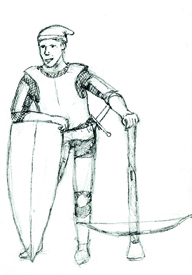 There he began his training as a rank and file infantry soldier brandishing a polearm in formation. The disciplined conflicted with his nature and he was all to happy to escape the life of a soldier for the travels of a mercenary hired to protect caravans. His brave and bold nature makes him eager and ready for adventuring. Gary Gygax Tribute: Thank You. Well Gary is Gone. I would like to thank him for the hours of my life spent free of charge, the increased learning through vocabulary, math and otehr business required for an elementary student to understand the most unlimeted game imagened and much more. Although all of your tennants where no followed, such as the use of monsters becoming prolific in what you considered a human centeric world, you helped indeed lay the ground work to make such an argument possible. Thanks for everything and I hope your adventures are as exciting in the negative material plane, or where ever it is that heart dragon sent you. 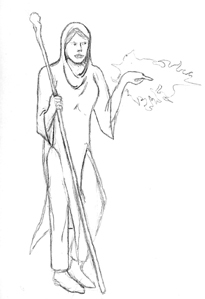 Often called Mother Matheria, this healer can be found in an oaken groove where she vies her trade. She is the mother of three boys, all rangers and rangers who may be lurking by at any time. Her nature is kind but stern. She is willing to help good characters for a small fee. Neutral characters can be healed for a larger fee and never for evil characters. She has a vast amount of knowledge that she dispenses for free to those that she likes. She also has 3 pet brown bears that are with her at all times, she loves them very much and they will aggressively defend each other. She also has a pet owl that keeps watch over them at night. Matheria can be quite brutal when she finds the natural balance upset, and she doesn’t mind feeding living beings to her bears. 8 magical stones. 3 Fog, 2 cload kill and 3 fire ball. This is a map of the Eastern half of a continent. This is the side that is most inhabited by humaniod races. The Western side remains in an earlier, bronze age state of developement and is not easily accesible. The oldest inhabited regions, the NorthEast are very dry, while the humans nations tend to reside in the SouthEast. However they can be found sparadicaly in other regions. 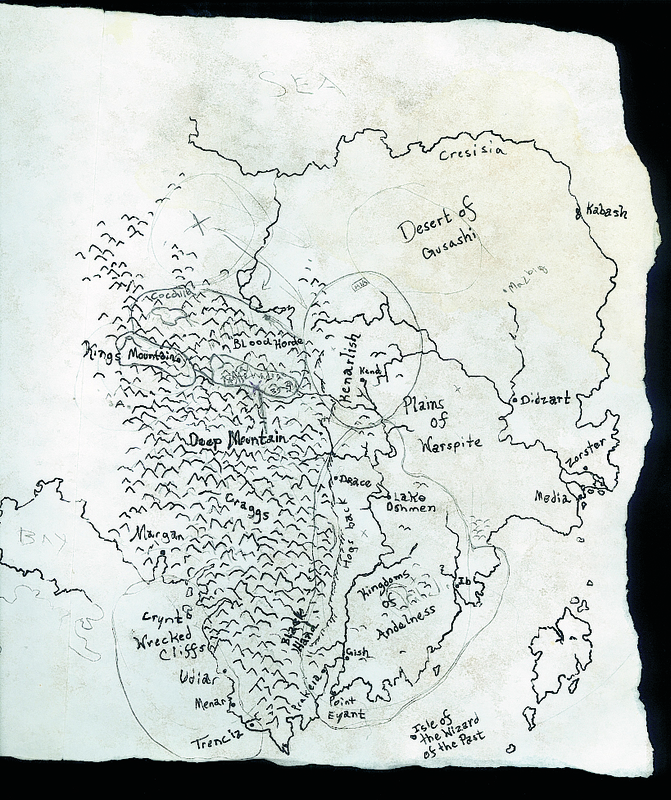 The large mountain range, The Craigs, found in the center of the continent is the result of a catastrophic war between the gods. This happened just before the start of the current age, and is but a distant memory to the races. Once a good, wise and caring Lord, valens had a bizarre transformation. He had a habbit of overlooking his lands from the top of his keep, making sure that all was well with his serfs. 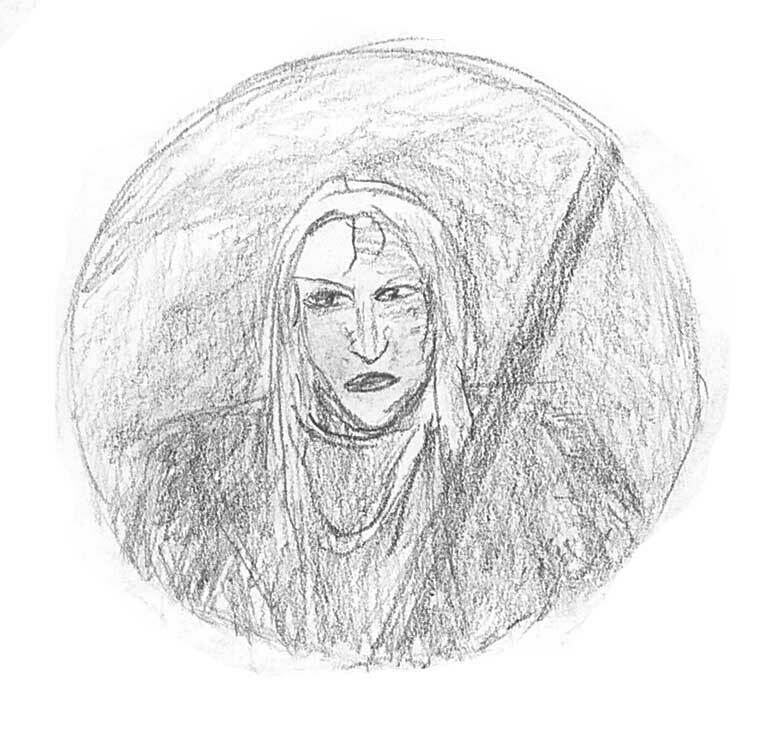 However, tragety struck when, due to his lack of understanding concerning electricity, he was standing vigil during a thunderstorm in full plate armor on his keep. A bolt of lightning struck him to the ground in a bright flash that could be seen for miles. When his men reached him his body was smoking, and it is rumored that lightning flashed through his armor. (Rumors still say that lightning flashs through his armor and eyes when he is angered. ) Mirraculously, Valens lived through the shock, however he was never the same. 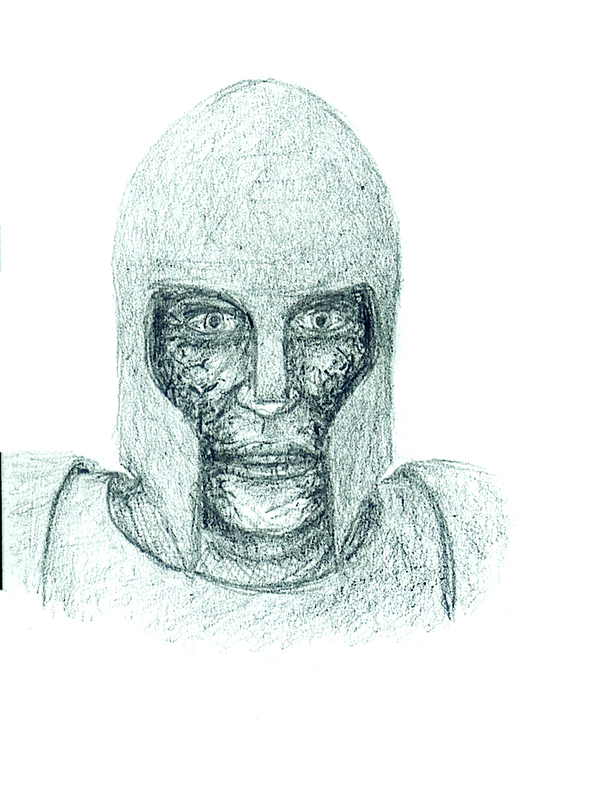 His skin had been charred and painfuly melded to his armor and helm. But worse, his entire elignement had changed, and he now became an oppressive, abusive overlord. He has become prone to rage, and taken to surounding himself with significantly less reputable assosiates. Valens rules a fiefdom and resides in a castle. He still holds the title of duke and has great wealth and power. Any simularities to Darth Vader are strictly coincedental. It is reported that Valens is immune to electrical attack and can use the following spell like abilities: Summon Lightning, Lightning, and shocking grasp. History: Born to poor goat farmers Drijon made his way to the Eastern Sea where he joined the ranks of a pirating vessel. 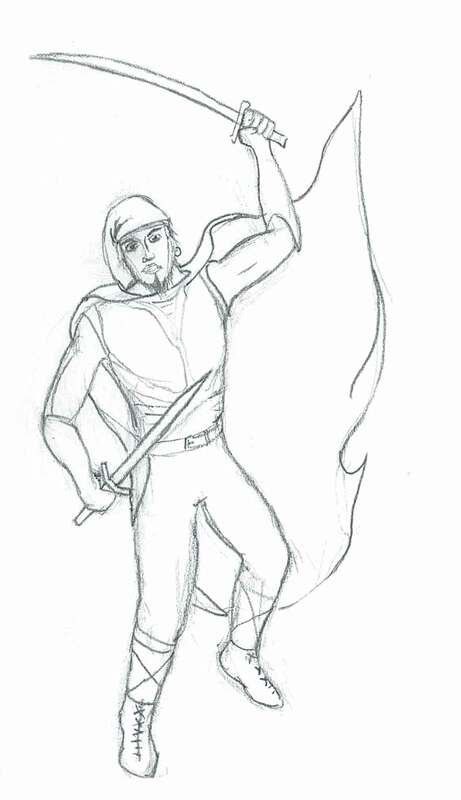 On the open sea he learned the arts of sailing, fencing and robbery, all with a flambouyant flare. Eventualy, seeking safer waters and greater plunder he made his way up the river systems to the West. Once in the Cities that dotted the river system he perfected his skills as a thief. His adventures adventualy led him to the foothills of the great Craigs where he was hired by the kleptocracy (rule by theives) of Peleram, where the corupt Council of Regents holds the reigns of power. The Council decided to put the bombastic thief to good use and he has since become an agent for hire in their service. He has a black cape that hides his brightly colored shirts when he wants to go unnoticed. When in action he wears dark brown studded leather armor.